A major grant is up for grabs and Westbrook’s Phil Spiller is working overtime to make sure the city applies. When Phil Spiller Jr. was helping search for potential funding sources for the new community basketball court project at the Cornelia Warren Recreation Area, he came across a grant that Westbrook hadn’t sought for three decades. However, that source, from the Land and Water Conservation Fund, had to be pounced on quickly. The $300,000 grant, with a $300,000 match, could allow the city to pursue a substantial makeover of the area, which includes a public pool, ball fields, and part of the city’s riverwalk overlooking the Presumpscot River. To Spiller and those working on the project, the area is a community sanctuary in the heart of a historic piece of downtown Westbrook, but is afflicted by poor visability, accessibility and aging facilities. This Friday, after countless meetings, a full community survey and growing support, a grant application will be filed to move the city one step closer to a second and third phase of work. Spiller and city officials have big plans for the public property. Some items shown on the concept design include improved public and handicapped access and parking, improved visual and physical access to the Presumpscot River with riverwalk upgrades, a walking history trail, a natural playground and splash-pad feature, and lighting and electrical upgrades. Last month, the Downtown Westbrook Coalition assisted Spiller in creating a public survey on the recreation area, which yielded more than 600 responses. Some comments also shed light on the challenges the property faces. Spiller said the majority of respondents live in Westbrook, and they answered questions about their awareness of the area, reasons for going there, the entrances, lighting and security, the footpaths and more. The first phase of work showed residents a preview of what the entire area could look like. Just recently, the renovated basketball courts on site were opened to the public, following more than $200,000 in upgrades. That project was organized in memory of Trey Arsenault, a Westbrook athlete who was killed in 2015. Peter Burke, a Westbrook resident and landscape architect who drafted a concept design for the next phase of work, said last week that boosting connectivity is a major piece of the project. (It also boosts points in the grant-scoring process.) There are three entrances to the area, including the main entrance from Main Street into a dirt parking lot, but none has proper lighting or signage. Burke, who lives nearby, is hoping the upgrades to the area can benefit Westbrook in multiple ways. For one, he said, it is designed to make the facility a more inviting place to a wider range of ages and abilities. While a natural playground and splash pad could attract families and children, picnic areas, seating and ADA- accessibility could welcome seniors. “All of these components taken together will add up to a huge facelift for the area and should invigorate not only this end of the riverwalk, but should have a positive impact on this end of Main Street, as well,” he said. The area was opened in 1921, dedicated by Cornelia Warren and then Gov. Percival Baxter. A major piece of the upgrades is also focused on the riverwalk, where ideas include a walking history trail and exercise stations. The history trail would stem from the “boy and his dog” sculpture from 1921, which lies behind the softball field backstop. It would also add a series of historical information signs in nearby locations. To date, the project has also received more than 50 letters of support, which will be included in the grant application. Letters have come from various city departments, businesses, state organizations, and local and state politicians. A letter received last week from Kirk Mohney, the director of the Maine Historic Preservation Commission, strongly supported the walking history component. Both Mayor Colleen Hilton and mayor-elect Mike Sanphy also submitted letters of support. Hilton said the facilities are well-used by the community, but suffer from a lack of visibility. “The lack of a visible entryway and signage speaks to our need to improve the amenity so that all of our residents can share in the benefits of this recreational complex,” she said. Sanphy, who is also president of the Westbrook Historical Society, said the walking history trail can allow the city to “tell the story of its rich history” in a public open space. While Spiller has taken the unofficial lead on the second phase, many have spent considerable time on the project, including School Committee member Suzanne Joyce, and members of other city departments, such as Maria Dorn and Arty Ledoux. Dorn, the director of community services, which oversees the Warren pool, said Spiller stepped up to spearhead the project after the first phase of work uncovered other problems in the area. “He took it to a different level,” she said of Spiller. According to Spiller, the last time the Land and Water Conservation grant was utilized in Westbrook was during the 1980s, but it hasn’t been used since. 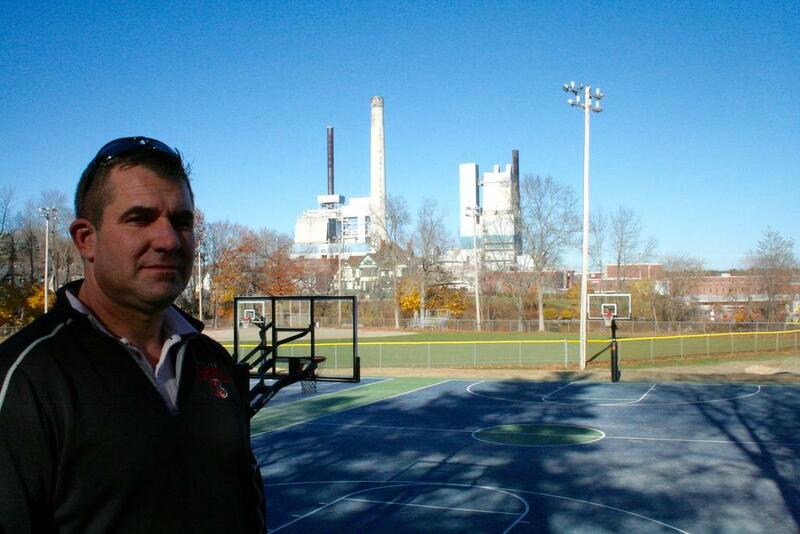 Until the basketball court rehab, the area hadn’t received significant upgrades since the 1980s. The City Council voted unanimously last week to authorize the grant application. During the meeting, City Administrator Jerre Bryant said the federal grant fund has a surplus, and is offering larger grants this year. Bryant also commented on the status of the area, referring to the riverwalk portion as “tired,” and stating that the sight of the new basketball courts highlighted the aging conditions of the surrounding amenities. “This will have far-reaching effects for the rest of the downtown,” Spiller said during the meeting. The area also includes the Warren baseball field on the other side of the railroad tracks stemming from Stevens Avenue. While Spiller walked the site Monday, he stopped to pick up shards of glass and other debris. The matching funds for the grant will be paid for by the Cornelia Warren Community Association, the Westbrook Environmental Improvement Corp. and funds already in place in Westbrook’s capital improvement plan. The city is also pursuing additional funding sources for the third phase of work. On Monday, Spiller, Burke and a handful of city officials were going over last minute details on the grant application. If awarded to Westbrook, the funding could be in place by next summer, with design and some work taking place next fall. The bulk of construction would then follow in 2018 into 2019. When asked how much time he’s spent on the project, Spiller, a pilot for Jet Blue, estimated he’s put in more than 500 hours between research, planning, meetings, coordination, and writing as part of the overall process. Spiller said he became invested in the project when he stumbled across the potential grant source after speaking with the late Bruce Doughty, who was the city’s first director of parks and recreation under Spiller’s late father, the former Mayor Phil Spiller. When improvements to the area were completed during the ’80s, Spiller said, he remembers his father telling him that the money didn’t go far enough. On Wednesday, Spiller stayed up until 4:30 a.m. working on the grant. Phil Spiller Jr., pictured walking along the path Monday near Fraser Field, has spearheaded a grant writing process toward more substantial upgrades to the Warren Recreational Area in Westbrook. A drone image depicts the Warren Recreation Area lying between Main Street and the Presumpscot River. Future improvements will be designed to make the area more accessible and usable by a wider array of residents. A concept plan shows potential upgrades to the Warren Recreational Area, including a natural playground, a splash pad and revamped paths, trails and parking.